mini-bosses, music, and four-player co-op are in the works! a few months ago, a co-worker and friend of mine – Steve – said he wanted to practice his AI-coding skills on “that space game” I’d made. “… which space game?” I asked. at the time, I had forgotten about Mysterious Space; it was a 7DRL project, and while I’d worked on it some after the deadline, to improve it, I’d since moved on. eventually we figured out he was talking about Mysterious Space. but at about that time, I was also getting back into a web game I’d started in 2004, but hadn’t worked on for about two years: PsyPets. I was planning on running a Kickstarter to fund its revival, and had started work on some major changes. player response to my planned changes was negative, however, so it wasn’t hard for me to get distracted with Mysterious Space… so I spent a few weeks working on Mysterious Space, made various changes, fixed some usability issues, and submitted it to Steam greenlight, where it immediately received a lot of positive feedback. and so, in the end, I gave the site to someone else: Annette. I offered her the game; she and her husband flew out to meet me; we talked about the game, the direction she wanted to take it. I showed her how to set up her machine for development, and I’ve been since helping her with development questions and issues, but have otherwise turned my attention fully on Mysterious Space. it’s crazy how such a simple thing – Steve wanting to do some AI coding for a game I’d forgotten I made – has had such a dramatic impact on my life! PsyPets was a game I created from scratch over 10 years ago, and maintained on-and-off until just a couple months ago. now March approaches – when I would have started PsyPets’ revival Kickstarter – but… for me, PsyPets is gone. it’s kind of crazy to think about. if I were a slightly-more sentimental person, I’d probably have cried! and that brings us to today: Mysterious Space has unlockable ships, secret levels, co-op play, pools of liquids on planets, and many other features it didn’t have just a few months ago; it’s been in a groupees.com bundle; I’ve been working with DDRKirby(ISQ) on a soundtrack; and now, at last, Steve is digging into into the code, learning it, and preparing for A* path-finding and pattern-recognizing/learning AI bosses. so: what’s in store for the next release? four songs are already in the game, and DDRKirby(ISQ) is working on a fifth after our hour-long hangout on twitch.tv. today I helped Steve get set up with Visual Studio and MonoGame, and after that, began work on a mini-boss: Regenerating Rigel, a ship made of many segments which regenerate until its core is destroyed. 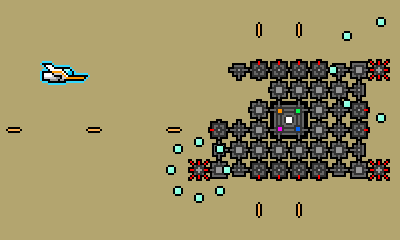 the 8-way firing weapons in the corner fire EMP bullets (they slow you, but do not hurt you), while the guns along the sides fire regular, damaging bullets. the speed at which its pieces regenerate depend on the number of players (including orbitals) in the game… more players = faster regeneration, so when playing co-op, make sure to group up when Regenerating Rigel appears! one final note: mini-bosses – Rigel included – will drop Fuel, so their destruction will be required in order to clear the level.